This tool is freeware, so users can embed it anywhere. No charge at all. We will help you to debug any kind of bug. If you are ready to work with us, we are ready to work with you. 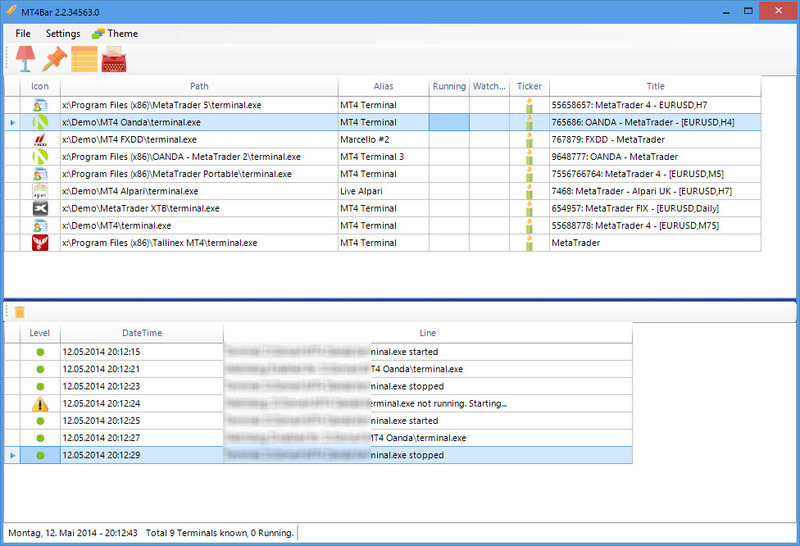 MT4BAR is logging many actions into logfile logs.sil. This file is inside your Application Home directory, its usually c:\Program Files (x86)\MT4BAR, but this may vary based on your installation. Please report any kind of bug to support@fx1.net and mention a) description of problem in english verbosely b) include logs.sil file c) your name. We will try to answer you as soon as possible. We cannot process requests they dont contain enough information. Please reprocedure the problem on terminal and send us logs.sil file after that. This file will be overwritten everytime you start MT4BAR, this means if you reprocedure the bug and start mt4bar, logs.sil will get overwritten and information is lost. So please send us logs.sil file right after you have reprocedured the issue. MT4BAR is ongoing project, we will try to implement new features into it to make your life easier. Please use 'Feature Suggest' button inside application to send us your suggestions. We will definetly read all suggestion. Of course we cannot promise to implement all suggestions but we will try our best to implement most suitable features for you and other community membres. This tool is able to install .mq4, .ex4, .dll, .mqh files automatically with drag&drop technology. You can drag as many files as possible and drop on to one of the terminals and they will be automatically installed. This feature also supports .zip files. Zip files will be automatically unzipped and installed. MT4BAR has built in Ticker. This is full implementation of our mt4ticker tool. Imagine how much money you would loose if one of your Terminals crash while its unattended. Such a scenario may cost you bankruptcy in worst scenario. MT4BAR´s WatchDog Feature is able to detect unresponding terminals and start them as soon they have freezed or crashed. This feature is something everyone needs. For several features we need a middleware which will act as communication bridge between Metatrader4 Terminal and MT4BAR. We have designed an indicator for this purphose. '## MT4BAR.ex4' can be found inside Installation folder. Of course you can install this file manually to any Terminal but MT4BAR will install this file fully automatically to your Terminal upon detection. If you dont see ##MT4BAR Indicator under 'Indicators' or 'Custom Indicators' Tree, you might need to restart your Metatrader4 once, right click to 'Indicators' tree and choose 'Refresh'. 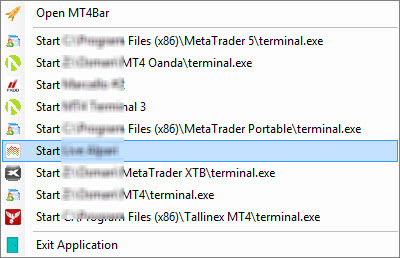 If you still dont see it, you can install it manually, simply put ## MT4BAR.ex4 file into Indicators folder yourself. This can be done conventional way or you can simply drag & drop install using MT4BAR. 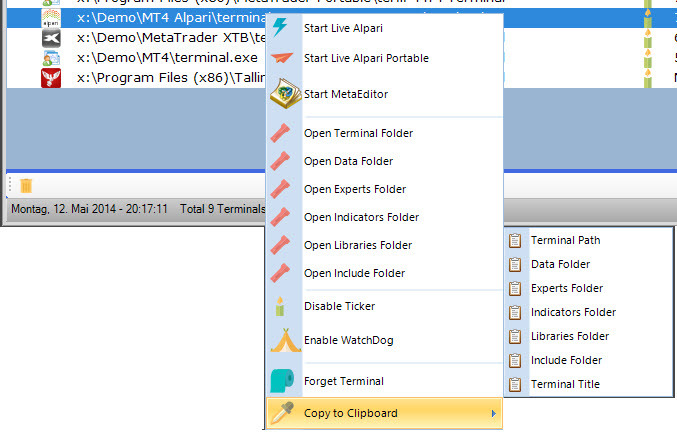 You will find "Install MT4BAR Client to Terminals" option under "File" menu. This option will try to install ## MT4BAR.ex4 to all known terminals. Normally you will never need this option but in case you need, use might try it to mass-install the file. We recommend to use ## MT4BAR Indicator. Please do not put on more then once per Terminal, this might lead to problems. Version 2.5 and up has Risk Calculator App included. This App can be used stand-alone or started from mt4bar. RiskCalc can communicate with Metatrader4 using ##MT4BAR.ex4 middleware. You have to put on ##MT4BAR Indicator to any chart on Metatrader terminal. Please see this video to see how it works. Risk Calculator is very accurate and realtime lotsize calculator. It can be used to calculate risks for any Symbol. It supports unlimited number of Terminals and Symbols. This tool has been designed for professionals. Download setup file and execute it to install this tool. Our setup tool has a native uninstaller. You can uninstall this tool anytime without any further complications. All new windows versions have UAC Feature. It means Processes may run under different Users. Every user has its own domain and environment. What does this mean for you? Imagine you run one Metatrader terminal as Administrator, then MT4BAR which runs under another user must not access Administrator domain. In such case we recommend you to run your terminals and MT4BAR inside same User. Running MT4BAR as Administrator might help but then all your terminals will be started as Administrator because MT4BAR is running as Administrator. Its important you understand this point. CPU & RAM issue has been solved. This version is using 80% less CPU and around 20% less Memory.